This past weekend, Rogue Alliance had a fantastic time attending Big Apple Con in midtown Manhattan for the second year in a row. The whole event was incredibly fun and a huge success, both in terms of entertaining guests and raising money for charity. Here are some of the highlights. So many old friends stopped by to say hello at our table in Artists Alley, and we made some new ones too. Many of the amazing cosplayers at the con took a moment to pose with lightsabers for our Facebook and Instagram pages. but you don’t have to be from a galaxy far, far away to love the lightsaber. Other characters who tried out the light side (or the dark side!) include Ursula the sea witch, Scarecrow and Mr. Freeze, and some snazzy Avengers (and Loki) in their flapper dress bests. Even the Men in Black invited our Rogues to help protect Earth…or did they? Our memory’s a little fuzzy on that one. Really, though we saw a lot of great costumes (some of which are featured on our Instagram... hint,hint). We even got to meet a fellow Star Wars fan and member of the Star Wars costuming community who had traveled all the way from Italy, which reminded us how big the fan community really is, and how these fandoms that we live transcend borders and languages. We want to give a huge thank everyone who donated to The Trevor Project this weekend. Statistically, LGBTQ+ teens are at a much higher risk for suicide and self-harm than teens overall, and often they don’t have as many resources to turn to for help. The Trevor Project provides teens and young adults with resources such as hotlines, instant messaging services, and counseling where those who need help can reach out and be heard by people who care, and who seek to remind everyone that It Gets Better. This is a cause close to our hearts, and an incredible number of people gave over the weekend. 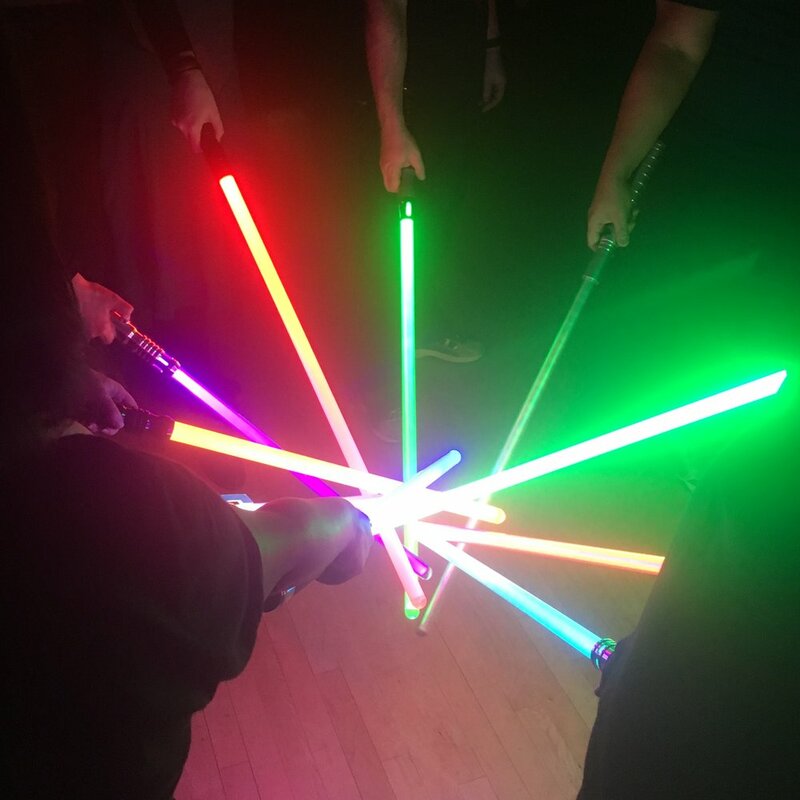 We got to end our weekend doing what we do best: showing off our lightsaber choreography and teaching younglings how to do the same. Following Captain Zorikh’scostume contest on Sunday afternoon, a few lucky recruits learned the ways of the Force and were set on their path to defending the galaxy. We even got a few adults in on the action. Our audience was so welcoming, and we had a wonderful time with all our volunteers. Overall, we had a spectacular second year, and we can’t wait for Big Apple Con 2019. If you stopped by and liked what we do, please consider trying out a workshop or two, every Thursday night from 7-9PM at Ripley Grier Studios. Remember, any background is welcome, including no background at all, and you don’t need your own lightsaber right away. We promise to get you up and fighting ASAP, and maybe you’ll join us on stage this same time next year.